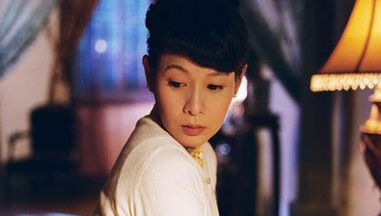 It is a switch and a turn of a performance from the webmaster’s favourite Fan Bing Bing, who ditched her beautiful and modern girl attitude for an evil spirit role. There is no denying that Fan Bing Bing is beautiful and her big eyes and great body shape is worthy of commendation, but rarely is she given such a juicy role as this and fortunately she doesn’t disappoint. In perhaps, her best ever performance, it ironically comes at her ugliness look and aided by make up and special effects, the moment when she scared the hell out of Leon’s mum, is probably more frightening than 10 normal HK horror movies. Adding to the mix is yet another engaging performance from Rene Liu, but it must be noted that she does not look like a 20 something and the fact that she is 40 and Fan Bing Bing is closer to 20, it is hard to cheat the audience. Still, a fine and captivating display, despite the role seems to be something that she has done numerous times before. Moving on to the performance to the heavenly king, Leon Lai, it must be said that the two actresses overshadowed his regretful and depressed performance. While Leon have improved from his blank delivery days as seen in Infernal Affairs 3, where he tackled a difficult character with a level of distinction, the same can not be said here. Lai is unable to connect to the audience and at times he seems more distant than relating, perhaps it is due to the script, but it ends up a rather disappointing display.